Well, this happened to me, after I uninstalled some program. 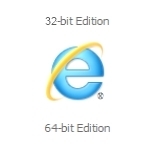 Internet Explorer 64-bit would open, but IE 32-bit would not open on my Windows 7 64-bit. Nor would Internet Explorer No Add-ons open. When I clicked on the icons of these two nothing would happen; but when I clicked on the IE 64-bit icon, it would spring to life. The Windows Club IE 32 bit, IE 64 bit, internet explorer 32 bit, internet explorer troubleshooting. permalink. I have to also say, that IE 64 Bit works faster when you have the 64 bit instead of. Very interesting.. Facebook Links would not work with IE ( for a while. So, I tried Chrome and all worked well. Just tried the IE 64 Bit and all is good. Go Figure! Magic jack plus will not work on windows7,64bit. Windows vista my Windows installer keeps getting delete in windows services. How can i stop this from happening and do i just install the windows installer.